Unlimited access to purchased courses for 12 months. This package contains introductory courses in assurance, accounting and other relevant skills that are appropriate for junior level staff or a refresher for other levels. Join us to learn about the changes made in the accounting and assurance standards. These are changes that have been effective or issued in 2018. In this 3-hour on-line course, you will learn how to perform a review engagement under CSRE 2400 using PEG 2018. This is an interactive online course using case studies, sample forms and real life scenarios. Webinar: Compilation Standards are Changing! The AASB has issued an exposure draft on Compilation Engagements. CSRS 4400 - Compilation Engagements will likely significantly change how practitioners in Canada perform review engagements. Focus on Form 2018 are on-demand videos for each of the key PEG 2018 audit and/or review forms. On-demand videos for each of the key PEG 2018 audit and review forms. Learn how to use and complete the PEG forms on a form-by-form basis. Each video is approximately 5-7 minutes and illustrates how to document audit evidence and discussions using examples in the PEG 2018 audit and review forms. On-demand videos for each of the key PEG 2018 review forms. Learn how to use and complete the PEG 2018 forms on a form-by-form basis. Each video is approximately 5-7 minutes and illustrates how to document evidence and discussions using examples in the PEG 2018 review forms. On-demand videos for each of the key PEG 2018 audit forms. Learn how to use and complete the PEG forms on a form-by-form basis. Each video is approximately 5-7 minutes and illustrates how to document audit evidence and discussions using examples in the PEG 2018 audit forms. Brought to you by the authors of the Professional Engagement Guide. Check out our 2018 Focus on Forms videos for audit and review engagements. We show you how to fill out the new forms with real life examples and sample completed forms. 2018 Audit forms comply with the new auditor reporting standards. On-demand videos for each of the key PEG 2017 audit and review forms. 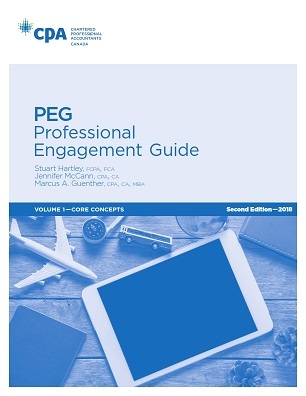 The 2018 Professional Engagement Guide (PEG) is now available. This 2nd version of the PEG incorporates the requirements in the post-auditor reporting handbook which will be effective for period ends ending on or after December 15, 2018. Get all 13 of our current Excel courses at a substantial savings! This course will provide participants with an outline of the key requirements for business combinations in accordance with Canadian Accounting Standards for Private Enterprises (ASPE). This course uses various examples and case studies to illustrate the principles put into practice. This basic introduction to ASPE provides, through a real life scenario, the basic key concepts in preparing a financial statement under the accounting standards for private enterprises including recognition, measurement, valuation and presentation and disclosure requirements. In this course you will learn about the accounting standards for not-for-profit organizations. You will learn the major differences from the standards for profit oriented entities and the unique characteristics in the presentation and disclosure requirements of not-for-profit financial statements. This course helps you understand why you as a professional, executive or as an organization need to have a presence on LinkedIn. Each FocusCPD Course and Package has been designed by a Canadian CPA or industry expert and is professionally produced. Following each FocusCPD lesson, participants will answer a few key questions to ensure the new skills or information shared are understood. Access to each package or individual course are provided for 365 days (1 License). Multi-licenses available. FocusCPD Certificates are valid for all Canadian CPA bodies including but not limited to CPA Canada or the Provincial Bodies.